Color outside the lines. Wear white after Labor Day. Leave the toilet seat up. Go ahead, fight the power. Not all rules are made to be broken, but some of them should be—at least on occasion, and probably with some qualifications. And so it goes in the gym. There are some workout edicts that you can, and perhaps should, disobey. The bias is toward barbell, dumbbell, or body-weight exercises over their mechanical counterparts. Why you should break it: Of course, there are some instances, such as leg extensions, when the machine is the only good option. But let’s deal with the tougher choices where machines mimic free-weight lifts. A curl machine may resemble a preacher bench, but it adds a crucial advantage—gravity. By shifting the gravitational pull from the slanted arm pad to a horizontal weight stack, equal tension is applied to the biceps all the way to contraction, unlike a barbell preacher curl that begins losing tension around the halfway point. Similarly, the weight stack of a chest flye machine keeps pressure on your pecs throughout each rep, while its dumbbell counterpart loses it as you approach contractions. The prevailing rule is the one Isaac Newton discovered more than three centuries ago: Gravity matters. And for that reason, sometimes machines are better options than free weights. Because it’s such a taxing exercise, start your workout with deads when your strength and energy are maximized. Why you should break it: The same argument can be made for deadlifting last. By ending your back routine with deads, you can better target your pre-exhausted dorsal muscles. Also, you’ll have more strength and energy to apply to all the other exercises. By the way, this reasoning for saving your biggest lift for last applies to other compound exercises for other body parts, such as bench presses in your chest routine and squats on leg day. Lock the weights in place to prevent them from potentially sliding off and causing an injury. Why you should break it: This is great advice for cambered bar exercises like overhead triceps extensions, because a shorter bar can teeter substantially, shedding plates. Collaring is not mandatory for Olympic barbell standards like squats and deadlifts; however, it’s best to keep the metal in place. But let’s focus on one exercise where it’s good safety protocol to eschew collars. That would be the bench press. If you ever fail while benching alone and are trapped with the bar on your chest, you can get out from under it by raising one side and then the other enough to spill the plates, as long as they aren’t locked on. Ideally, your cardio is performed in a separate session from weight training first thing in the morning. But if you have time for only one workout, crank up the fat burning after hitting the weights. Why you should break it: If you’re doing high-intensity interval training, as we recommend, you can shuffle HIIT sessions into your iron workout. For example, begin with 10 minutes of sprinting and walking on the treadmill, work biceps, move to 10 minutes of climbing fast and slow on the StepMill, work triceps, do 10 minutes fast and slow on the elliptical, and end with abs. Alternating aerobic and anaerobic training keeps your workouts focused and allows you to crank out 20 to 30 minutes of cardio in palatable portions. Variety isn’t just the spice of training. For some, it’s the main course. 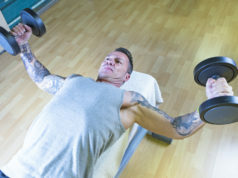 Exercises and their order are changed from workout to workout, all in an effort to stimulate growth by constantly attacking muscles from different angles with unique stress. Do each rep from a full stretch to a full contraction and back again. Why you should break it: This rule is way too simplistic, because it’s dependent on the exercise, as well as the definition of a full range of motion (ROM). It’s good advice for isolation exercises that have a short ROM. For example, there’s no reason to shorten up dumbbell shrugs, wrist curls, or crunches. And even isolation exercises with longer ROM, like leg curls and pushdowns, should be shortened only to eke out some extra reps. Things get more complicated with compound lifts. The lockouts of exercises like incline presses and squats are resting points. Stop just short of extension to keep tension on the muscles. In fact, to target your pecs or shoulders more and triceps less, skip the top third of their respective presses. Then there’s the question of what is a full ROM. It’s not always the longest potential journey. You could bring your knees to your ears when leg pressing, but doing so targets your glutes more than your quads and will potentially strain your lower back. A better rule is to stay within the ROM that best hits only your targeted body part. To avoid widening your waist, do only indirect or light work for your sides. Why you should break it: This gets back to the old canard: “I want to be muscular, but I don’t want to be too big.” If only growing were that easy! Your obliques, like every other muscle, don’t expand rapidly merely because you hold a dumbbell in one hand and bend to the other side. If you’ve seen someone with obliques that are “too big,” that someone almost certainly has a wide hip-bone structure and therefore a correspondingly wide waist. They can neglect obliques. The rest of us shouldn’t. Your obliques don’t expand easily, but they will grow—and that’s a good thing, because, when you’re lean, they’re impressive, drawing eyes to your abs. They’re also crucial for core strength in standing exercises. Work them with reps in the 10 to 15 range, and use resistance, as you would with other muscles. And, like other muscles, they’ll grow, but not too much. When training multiple body parts within the same session, hit the bigger one first when your energy and strength are greatest. For example, do back before biceps. This prevents an exhausted smaller muscle from giving out first in compound exercises. Why you should break it: This rule can be broken whenever the smaller muscle is unrelated to a bigger body part. So you can work, say, triceps before back or shoulders before quads. And you can do abs and calves at the start of almost any workout. (One exception: Calves should not be done before standing quad exercises, because your balance might get shaky.) Such unique pairings allow you to prioritize the first-worked muscles by separating them from their neighbors and compound teammates. “Thou shall not go behind thy neck” has become the ultimate gym commandment over the past couple of decades, and it’s applied to pulldowns, pullups, and shoulder presses. The punishment for disobeying this edict is said to be permanently wrecked shoulder joints. The meathead motto is: If you’re not doing free weight, back squats with heavy metal, you’re not trying to get big. Why you should break it: Let’s dismiss this one easily. Squats are an excellent exercise. for most trainers, but they’re not for everyone. People 6’2″ and over have a long way to go down and up, and they may struggle to do so with good form. And even many non-tall people find squats work their glutes, lower back, or knees more than their quads. Six-time Mr. Olympia Dorian Yates built two of the best wheels of the ’90s without stepping into a squat rack, and no one would accuse him of being soft core. The truth is that you don’t have to do any particular exercise. Instead, do what works best for your body. When doing exercises like pushdowns and barbell curls, keep your elbows stationary and move only your forearms up and down. Why you should break it: This is good advice for most sets. Bringing your elbows forward and backward fosters momentum, making the exercise easier, thus reducing stress on the triceps or biceps. 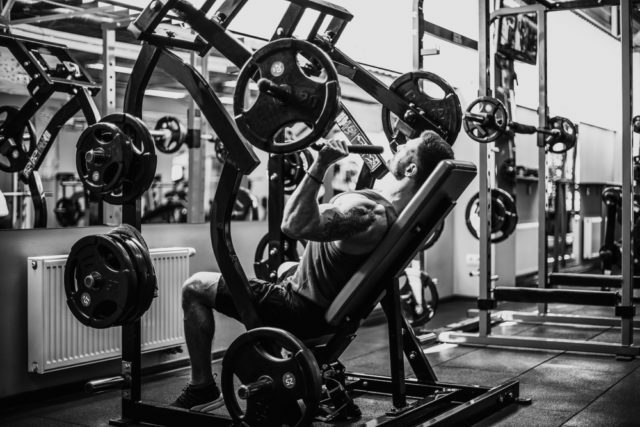 However, you can break this rule to eke out extra reps after reaching failure with strict reps. And you may want to break it on every rep. During drag curls, the bar travels straight up against your body while your elbows go backward. You can also do drag pushdowns, bringing your elbows back as you raise the bar and forward as you lower it. You can do both curls and overhead triceps extensions on a Smith machine—unconventional exercises in which the bar travels a straight path while your elbows move back as the bar goes up and forward on its way down. Scientific studies have proven that the moderate rep range is best for generating muscle growth. A muscle needs two or three days to recover from a workout. Hitting it more often may bring on the diminishing returns of overtraining. Why you should break it: During his Olympia reign, Arnold Schwarzenegger worked muscles thrice weekly in two-a-day sessions. He made an exception for calves and abs—which he trained six days per week! Body parts can be hit frequently—if done infrequently. That probably sounds contradictory, so let’s look at a couple of examples. 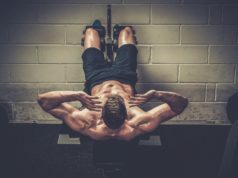 One technique for bringing up a lagging muscle is to work it several times throughout the day. So you might do 10 sets of close-grip pushups in the morning, afternoon, and again in the evening (frequently) but only once per week and as far as possible from your regular triceps routine (infrequently). Another technique is to hit a body part every day. Maybe you do high-rep side laterals four consecutive days (frequently), but only once per month (infrequently). Think of it as a surprise attack. Its rarity and audaciousness are the keys to its effectiveness. The 48- to 72-hour rule is not one you want to break regularly, but doing so on occasion may be just the jolt complacent muscles need. This popular motto encourages you to push sets into the agony zone to generate growth. Why you should break it: Embracing woe isn’t the only way to grow. Sometimes moderately intense pump-up sets are better. And even your most intense sets don’t need to be utter torment. Furthermore, perpetually torturing yourself can lead to mental burnout, if not physical overtraining, which is why high-intensity programs should include cycles of less stressful work. If “no pain, no gain” helps you grind out extra reps, great, but make it a rallying cry, not a rule.